It's winter here in Western New York, and there is nothing better to get you through those cold days than some good fashioned comfort food. I decided to make some cast iron skillet pork chops. This is another quick and easy meal to put on the table after a long day at work. Fran picked up some thin cut bone-in pork chops at the grocery store the other day. 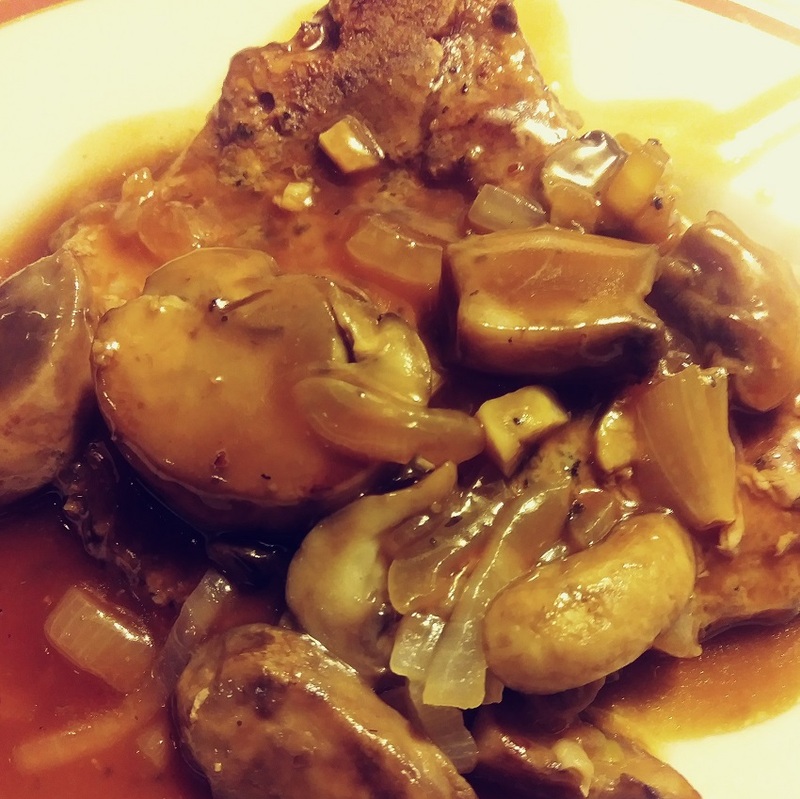 I had everything else that I needed to make these cast iron skillet pork chops. First I minced a clove of garlic and chopped a medium onion. 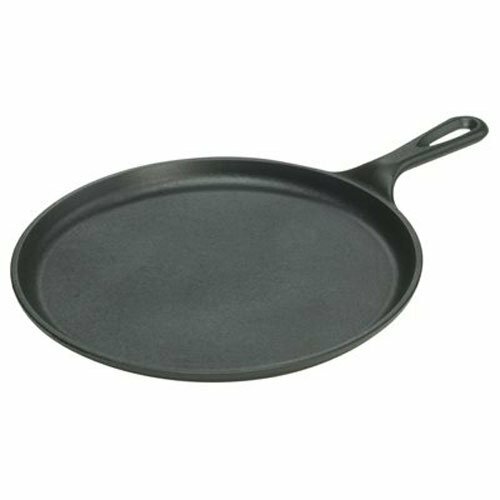 Heated 2 tablespoons of olive oil in my cast iron skillet. 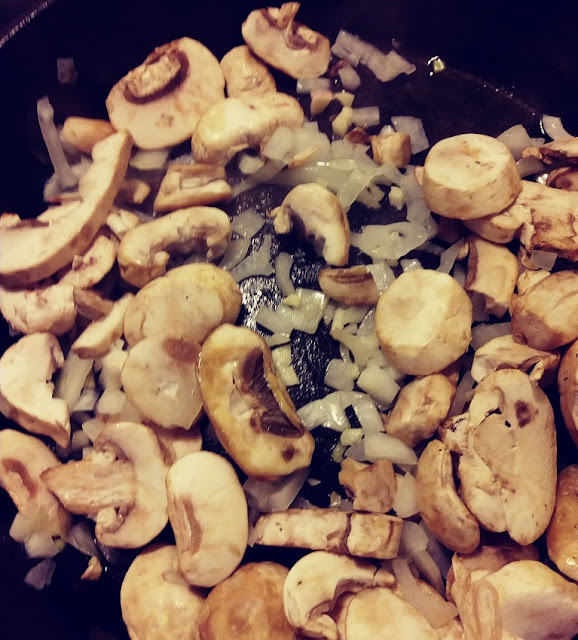 Then I cooked the garlic, and onions with 2 cups of fresh sliced mushrooms until they were tender. About 5 to 7 minutes over medium heat. I removed this from the pan into another bowl. I added the four pork chops and browned them on both sides. Seasoned with salt and pepper. About 5 minutes per side. 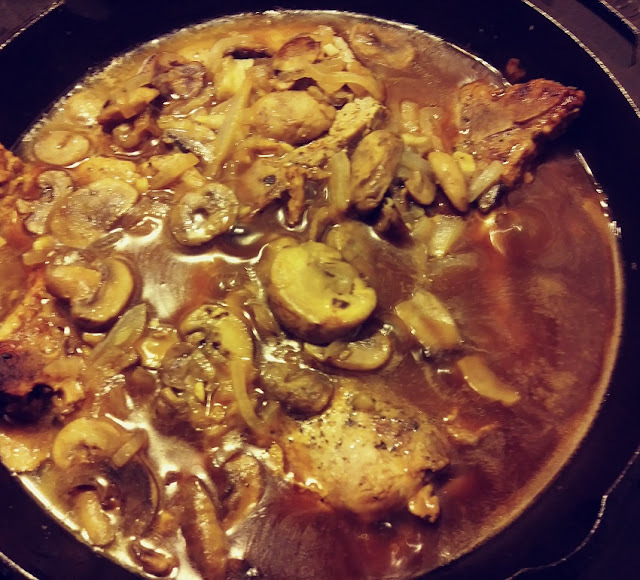 After the pork chops were browned, I returned the mushroom mixture back into the skillet. Then added a 12oz. jar of Heinz Pork Gravy. 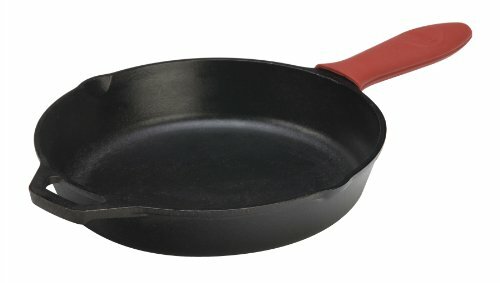 I covered the skillet and let it cook for 20 minutes over medium heat. Heat the oil in the cast iron skillet and cook the mushrooms, garlic, and onions over medium heat until tender. 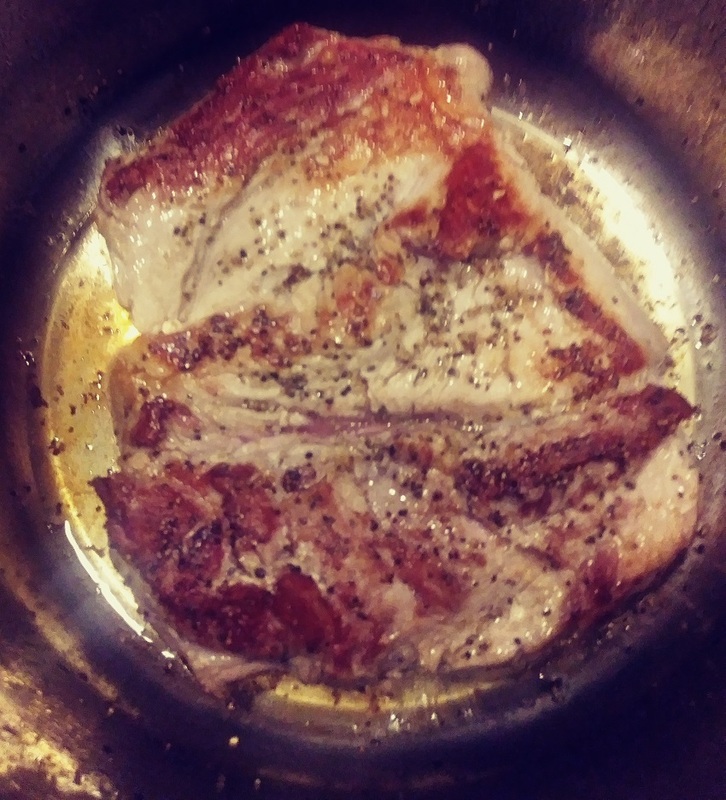 Brown the pork chops on both sides seasoned with salt and pepper. About 5 minutes per side. Return the mushroom mixture, pour in the gravy, cover and cook over medium heat for 20 minutes. That's all there is to it. In about 40 minutes you'll have this delicious comfort food on the table and your family is going to love it. Serve with your favorite vegetable or baked potato. We had baked sweet potatoes as our side dish. Note: I used thin cut pork chops. If you use a thicker cut of chops you may want to cook for more than 20 minutes. The guideline internal temperature for pork is 145 degrees with 3 minutes of rest time. 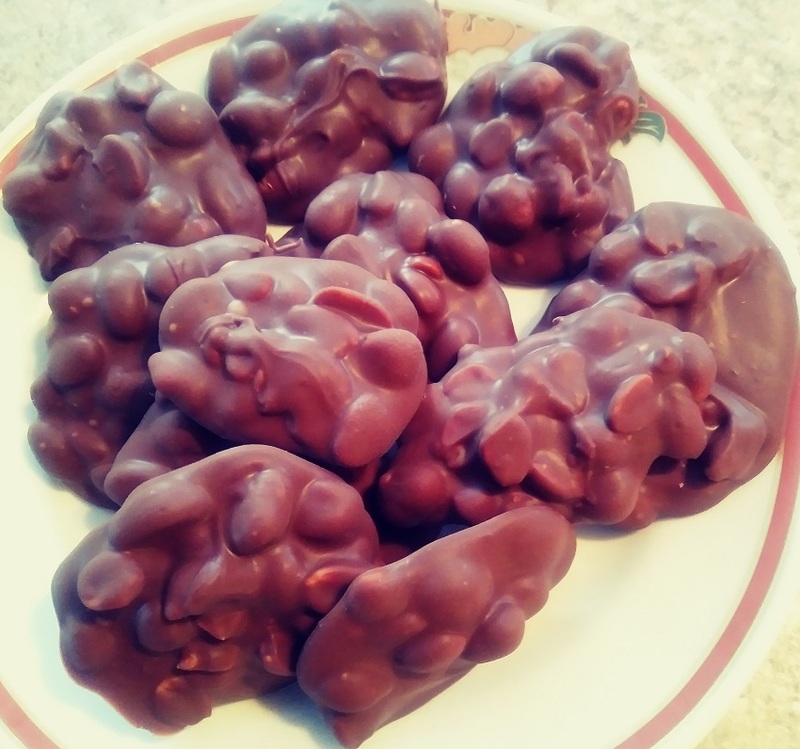 This simple recipe for these chocolate peanut butter peanut clusters was given to us by a good friend years ago. We normally make these every Holiday season. This year we just ran out of time and never got around to making these. That means that I had all of the ingredients in the house and ready to go. 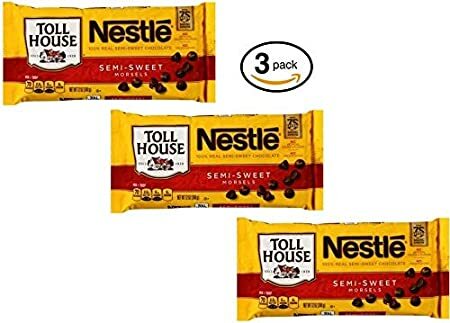 The AFC playoff game this Sunday was so one-sided, I decided to gather everything together and check these off my list for some sweet treats. 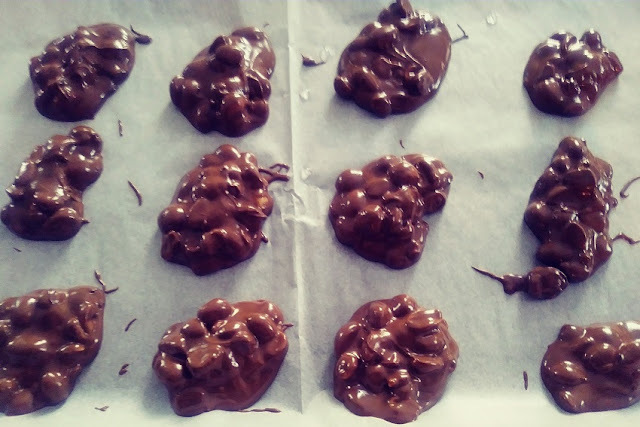 These little treats are just so easy to make. And, what a great idea to make them and keep some in the freezer for that chocolate and peanut craving. Here are the simple ingredients I used. Reese's Peanut Butter Chips, Semi-Sweet Chocolate Chips, and Salted Peanuts. 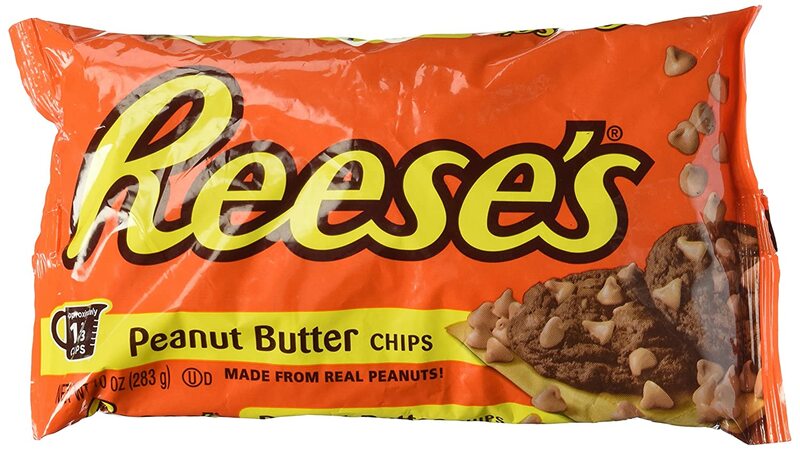 After melting Reese's Peanut Butter Chips and the Chocolate Chips together. I stirred in the peanuts and dropped them onto a cookie sheet lined with parchment paper. Stir chocolate continuously until all is melted and smooth. 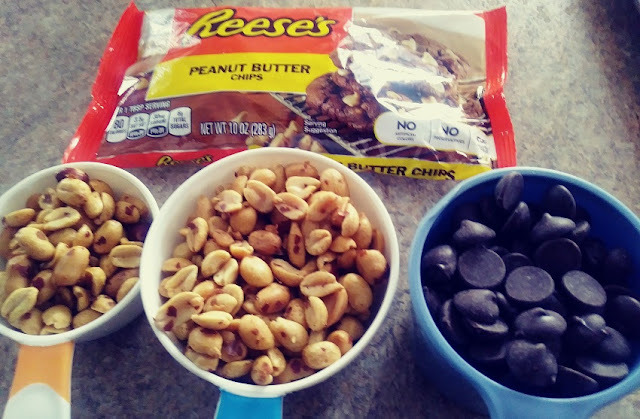 Add the peanuts, stir and mix well. 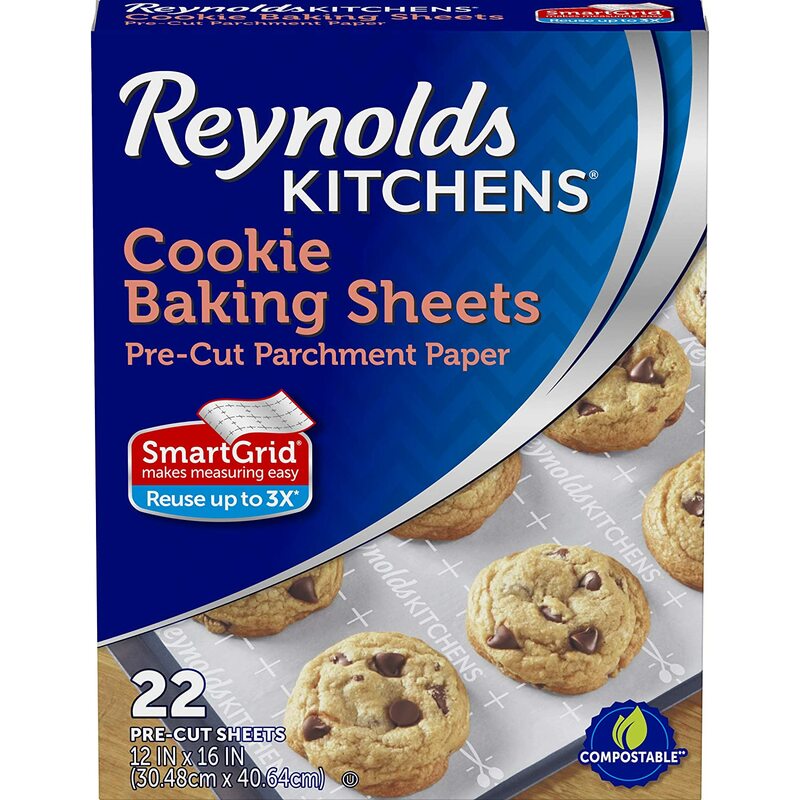 Drop onto cookie sheet lined with parchment paper using a tablespoon. Let them set up for a few minutes and place them in the freezer for about 10 minutes. I yielded 24 of these little treats but, I used heaping tablespoons. I probably could have had 30 or more if I would have used just a little less. This instant pot easy chicken noodle soup will surely warm you up on those cold winter days. 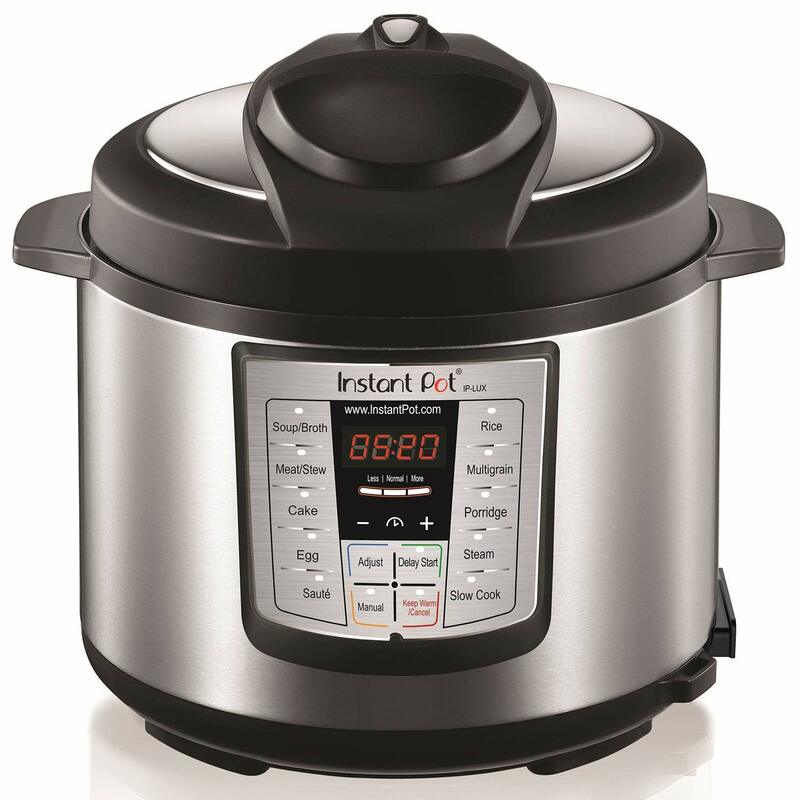 We are just loving our new Instant Pot. Fran had this soup ready in less than an hour. We enjoyed this hearty soup just before we left the house to watch our local hockey team play. Sadly we lost the game in overtime. But, at least we had this delicious chicken noodle soup before the game. It was the perfect meal before going to the ice arena. Press the saute' button and let the Instant Pot heat up for a couple of minutes. Add the oil, onion, carrots, celery, garlic, salt, and pepper. Stir and cook about 5 minutes to allow them to get tender. Add the chicken breasts (we removed the skin), Chicken broth, and water. Set and lock the instant pot lid and make sure the vent button is closed. 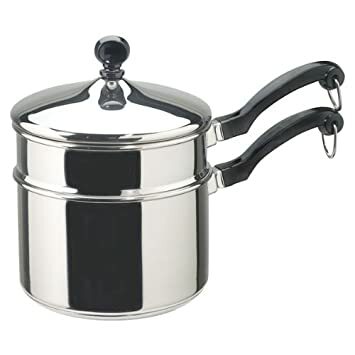 Press the Soup/Broth button and set the time for 30 minutes. After the cycle, open the vent to release the pressure, wait a couple of minutes before unlocking the lid. Remove the chicken breasts with a pair of tongs and let cool a few minutes. Press the Saute' button and bring the soup to a boil. While your waiting you can shred the chicken breasts. When the soup comes to a boil add the noodles. Cook the noodles to your liking then add the shredded chicken and stir in until all is mixed well. 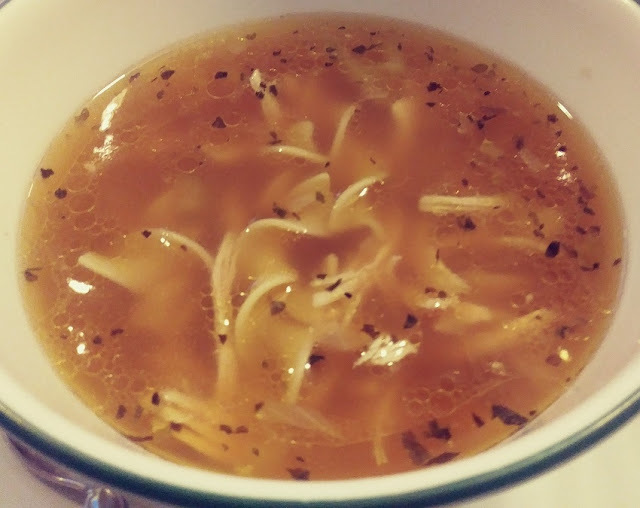 Now you can serve and enjoy this hearty chicken noodle soup. Ready in less than one hour and oh so delicious. Eating pork and sauerkraut on New Years Day is well known to be good luck for the New Year. I'm not sure that this always works but who are we to break such a well-known tradition. So, we always have our pork and sauerkraut on New Years Day. 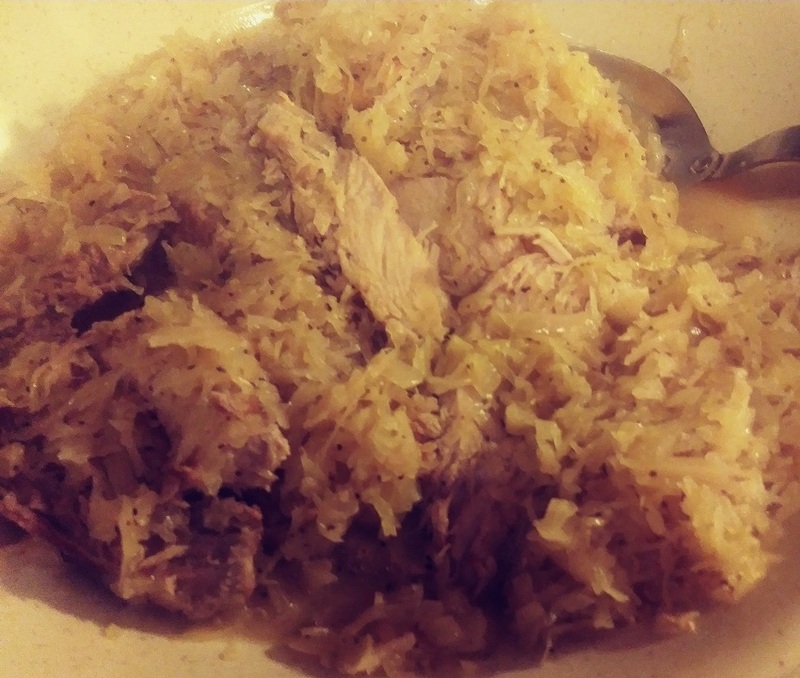 Since Santa brought Fran an Instant Pot for Christmas this year we thought what a great way to make our pork and sauerkraut. So far we've only made a couple of things in the Instant Pot. Fran made meatballs and tomato sauce the other day in about 30 minutes and it was delicious. And, this is coming from somebody who likes their tomato sauce cooking for hours. I didn't document the sauce process but, when we make it again I'll post it. The first thing was to brown the ribs on all sides. To do this, I let the Instant Pot heat, up and then added 2 tablespoons of peanut oil. I added some black pepper and browned the ribs on all sides. First I warmed up the Instant Pot by pressing the saute' button. Added the oil, black pepper and browned the ribs on all sides. I added the sauerkraut, brown sugar and water. Lock the lid in place and make sure the vent is closed. Pressed the manual button, then set the time on 20 minutes. After 20 minutes I moved the vent to open to relieve the pressure. Then pressed the keep warm button for about 5 minutes before opening. That's all there was to it. In about 30 minutes we were enjoying delicious Country ribs and sauerkraut. 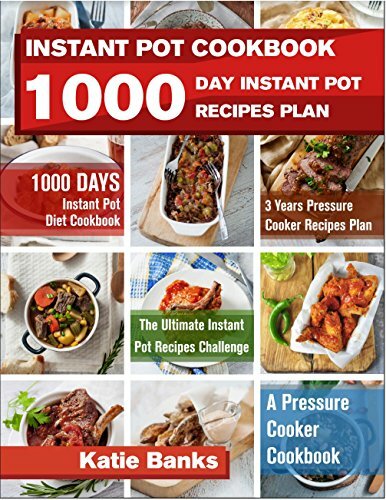 I highly recommend the Instant Pot for quick and easy meals. I can see why they say this is a real time saver. 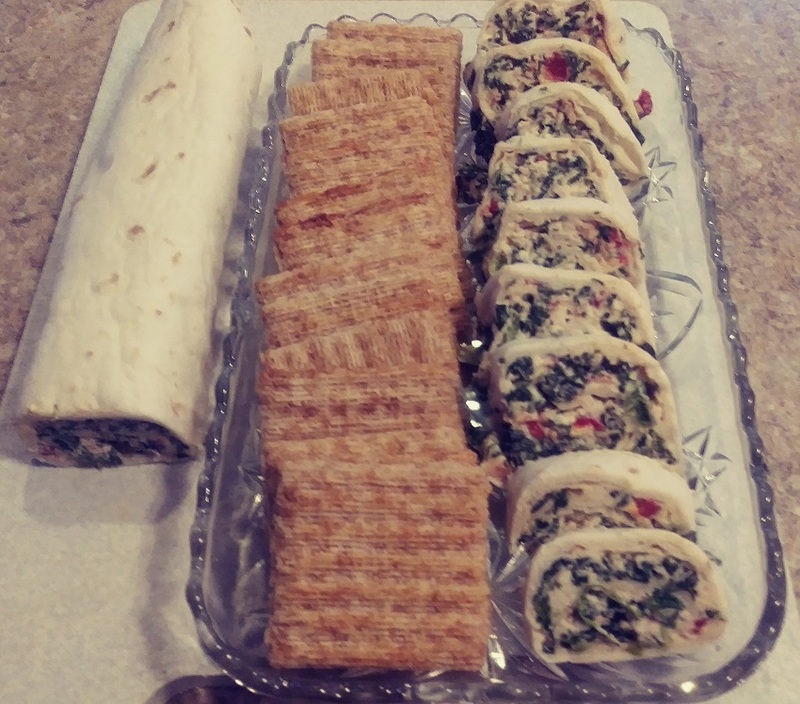 These spinach cream cheese roll-ups make a perfect appetizer for any party or just as a great snack. This recipe is sort of a different way to serve up spinach dip. You and your family are going to love this no-cook easy to make recipe. 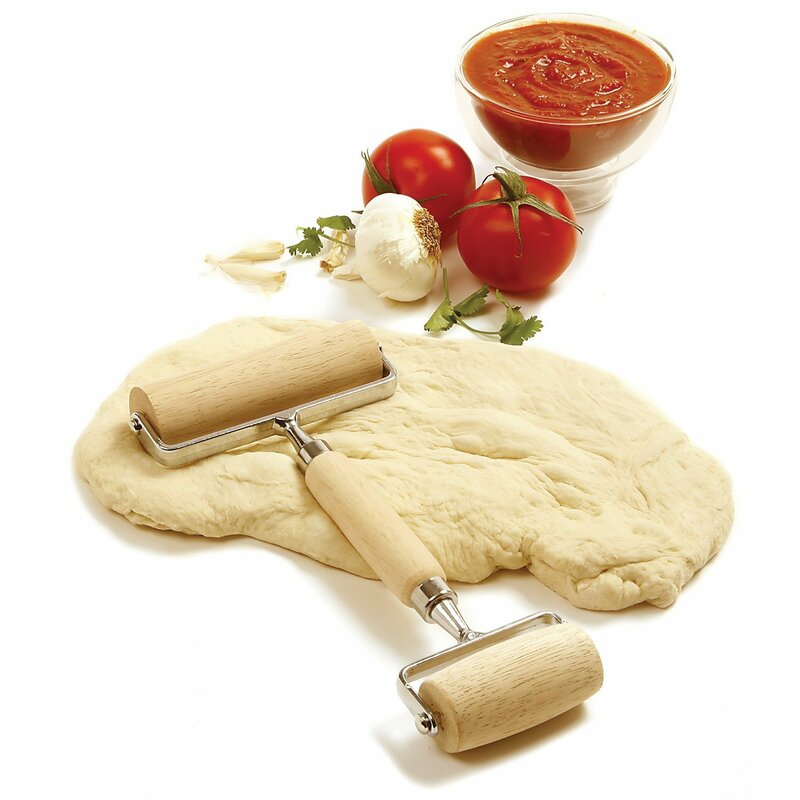 And, these will disappear just as fast as you made them. 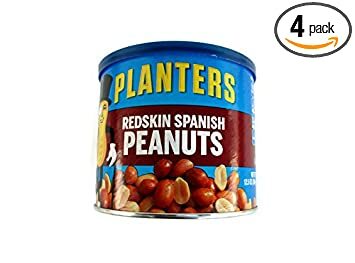 With the football playoffs coming up these are a perfect crowd pleaser for your guests on game day. And, for all of those bacon lovers out there, add some bacon bits for some added flavor. In a large bowl, mix cream cheese, mayonnaise, lemon juice, grated cheese, and garlic. Mix well with a hand mixer or KitchenAid Stand Mixer. Spread the mixture evenly on the flour tortillas. Roll them up tightly and wrap in plastic wrap. Cut them into 1/2-inch slices and enjoy.